If I were stranded on a deserted island trying to fix the radio, I would be happy to have one of these. Otherwise, they’re the subjects of a study in how to make DMMs as cheaply as possible. Purchased at Harbor Freight for $2.99 on sale. This is the one with the back-light. Of the two samples documented here, this was the better one. Obviously it would not hold up to continuous use, but it did give accurate repeatable readings. Also purchased at Harbor Freight for $2.99 with a coupon. This one looks a lot like the one above, but without the back-light. The build quality (relatively speaking, of course) was not as good as the back-light model. It gave steady repeatable readings on DC and AC volts, but in resistance and milli-amp modes, it would never give the same reading twice. Update #1: After re-soldering the input jacks, replacing the solder bridges with some copper braid, and tweaking the calibration pot, the 69096 meter functionality improved to be on par with it’s backlit cousin. I get the feeling it’s ‘luck of the draw’ with these things. Update #2: Everybody seems to have an opinion about these little red/yellow boxes, but I find myself disagreeing a bit with some of the stuff I read and hear online. So let’s do a little myth-busting. Myth #1: These 830-style DMMs are not accurate. 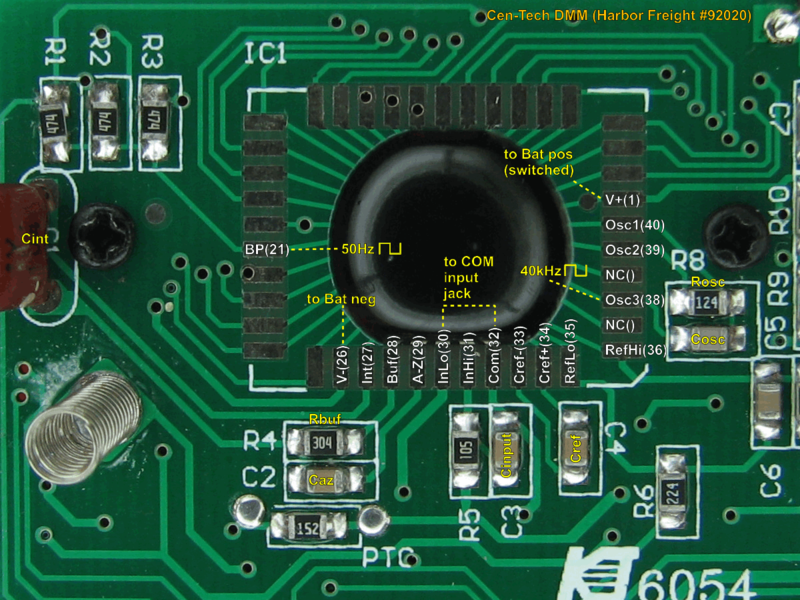 Actually, the ICL7106 Analog-to-Digital Converter/LCD Driver clone (under the black blob) is extremely well-suited for rendering very accurate DC voltage measurements. It is quite possible, even probable, that it can easily match a more expensive DMM digit-for-digit on the DC voltage scale, especially if the calibration trimmer is tweaked. (Some of the latest ones do not have a trimmer.) For functions other than DC volts, more variables are involved, so the word “ballpark” becomes operative. No, it isn’t. The Fluke is made to be reliable, remain accurate, and last many years and provide measurement confidence. This unit is made from a dollar’s worth of cheap parts and cheap plastic, and it’s a crap shoot as to whether it will remain structurally intact for any length of time. The leads are particularly short-lived. Myth #3: It will explode and kill you if you use it to measure the mains. If the meter and leads are in good condition, and you plug the leads in and set the switch correctly, it should measure up to 240 VAC in a standard residence with no drama whatsoever. No explosions. If the leads are plugged into the 10A current jack, or the range switch is set to ohms or current, then you might get sparks, smoke, and startling noises. Unless you’re holding the meter in your mouth, the only fatality is likely to be the meter itself. But please, don’t use this device anywhere near commercial/industrial distribution panels where deadly arc flash incidents are actually possible. Myth #4: These are good enough for a beginner or an amateur at electronics/electricity. These things can definitely lie to you. Low ohms measurements are likely to be way off. The AC voltage ranges are DC-coupled and will appear to read non-existent AC voltages in the presence of DC. The unreliable nature of the leads, the rotary switch, etc. can result in inconsistent readings at inconvenient times. This means trouble for users who cannot easily differentiate between a real fault and a failure of the measuring device. Novices do not need a $200 DMM, but they definitely need something reasonably reliable that is less likely to give misleading readings. Just $20 can get you a tool that is an order of magnitude better than these toys. Now you gave them a fair rating, they do work but you have to calibrate them. The ac side is ignored on mine, i know its crude so i dont use it. 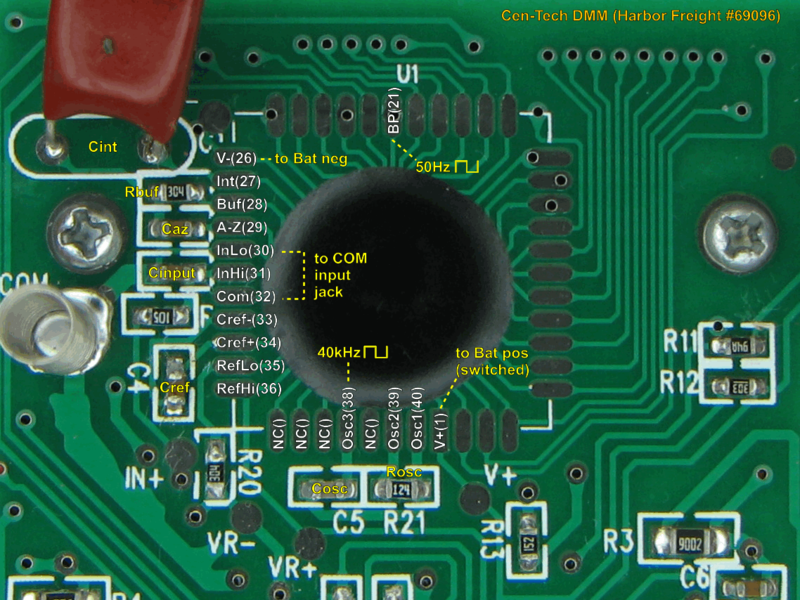 They have become very “Tight Arsed” with there pcb and component types. on terminal pcb lol, the resistors are the typical blue body 0.6watt through pcb types. sockets must be very clean to show 0.3 ohms when shorted. Its not the fault of the 7106 clone, its the cheap switch that causes problems. An ICL7106 alone would cost more than that!! plastic case around it, i would never ever expect the high voltage performance that some unfair testing people demand, the australian man, you know who i mean lol. The one i have does have the ptc for ohms 🙂 only needed if you are really a plonker lol. For $3, something has to be tight. Absolutely nothing wrong with the good old ICL7106. Did you catch this thread at EEVblog? The original 8060A designer tells us that Intersil wasn’t exactly authorized to bless the world with that design. Speaking of crude AC, that reminds me I left out the best picture, which has now been added to the gallery. Yes intersil was naughty but we would never of had such a great chip without them, fluke would have kept it to themselves and the multimeter market would be less interesting. I like the 7106 as you can get a very good result, ratio metric resistance and dc volts can be great with only 0.5% tolerance ref resistors. With the addition of a precision ac to dc converter the ac side becomes usable. Ha ha the 830b set on ac but dc was the input, well its a diode and a tapped into the resistor chain, cant expect much, perhaps a capacitor in series would have stopped the effect but it would not have improved the crude ac readings lol. I too have looked at the schematic of one the the old flukes you have featured and thought “that chip is wired like a 7126” almost, 1 pin different lol. Thanks for reviewing these meters. I have one of these still new in the package (I think I paid a $1.99) that I am wanting to do some destructive testing on. I would like to make it either burst into flames or explode. (Using only electricity.) If I can get it to do either one I will let you know. The thread on the EEVblog is fascinating. I would like to see you get your hands on some of the stuff he was taking about. I had something like those but it read only dc. It didn’t have an ac function as I got from some solar and water cell test kit. It worked fine and I would like something again like these just as a messing around meter when I don’t feel like getting out something better. And maybe a little destroying time. You do realize that on picture #23, the cheap little HF meter is set on ac volts and you are testing dc voltage on that battery? Ooops! I have one of these meters because it was free with a coupon. I only use it to see if voltage is present- pretty well untrustworthy, so I use the Fluke or FP meters for actual working. Not an oops, but a demonstration of an incorrect indication. I have a better meter, but I have one of these stashed on each floor of my house for quick-and-dirty. I especially appreciate the battery test mode. When stuff gets flakey, it’s always good to be able to rule batteries in or out. The test leads are the weakest point. 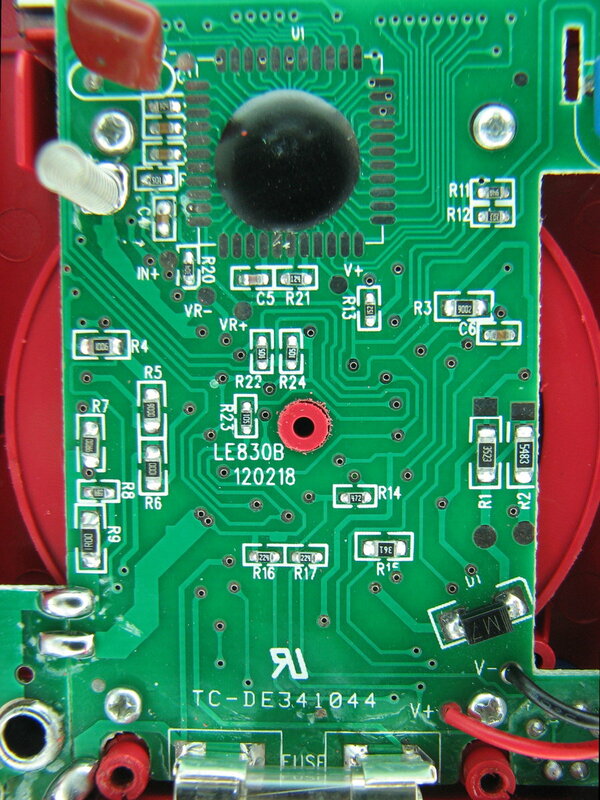 The wires are prone to coming out of the probes, and there is no provision for taking the probe apart and re=soldering. Then you discover that the jacks are shorter than standard so off-the-shelf test leads don’t work well. I wish Harbor Freight offered replacements that were also repairable. Yes even a cheap set of replacement leads are usually better than what comes with these type meters. I think if you cut the safety shrouds off of the banana plugs, standard leads will fit. I solved that with some very decent leads from ebay at $.99 a pair with free shipping, straight from China. A few seconds work fixed the banana plugs. I trimmed back a little of the outer sleeve and spread the spring blades so the widest part was closer to the end of the plug. I got a good snug fit. Also fair points you bring up. I was reacting to the self-appointed internet safety police who tell people it will “explode” if you use it on mains, which is silly. The same people may not think twice about plugging in a dollar-store night light, scent spray thingie, outlet strip or other questionably-made device. Know your equipment, know it’s limitations, use live-unknown-live testing when safety is at stake. And really, buy better equipment than these things!